I was surprised to see this book in the office of the Cooper Hewitt, Smithsonian Design Library, which is housed next door to the museum. As a yoga practitioner and incurably curious person, I offered to do some basic research to contextualize the concept of chakras, shed some light on the book’s notable author, and situate this unusual monograph in history. 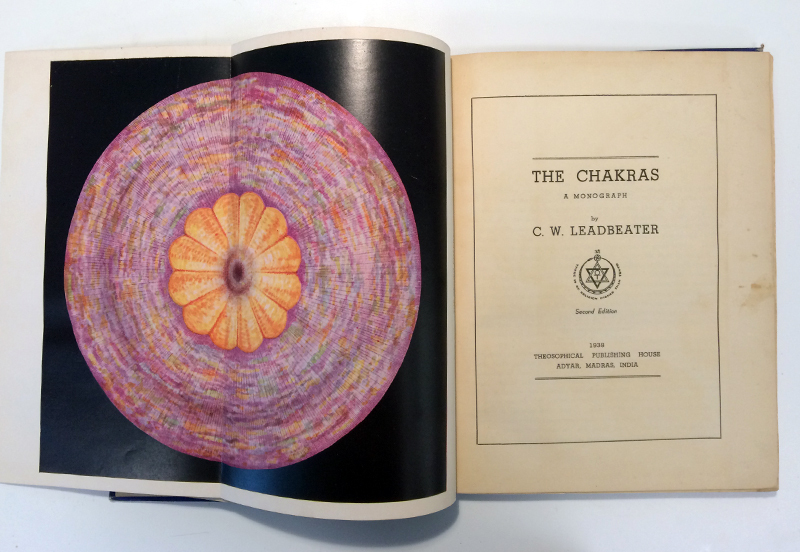 Printed in 1927 in Adyar, India by the Theosophical Publishing House, this second edition of The Chakras is a 102-page hardcover containing 10 “plates,” or full-page illustrations, each protected with a tissue paper insert. The book’s author is C.W. Leadbeater, an English priest who left the Anglican church around 1883 to study occultism, esotericism, and eastern spiritual traditions. He was a man who made the most startling claims for himself, and made them in a very matter-of-fact way; he declared that he had penetrated the depths of the atom by his psychic powers, discovered the ultimate unit of physical matter whilst sitting in a park on the Finchley road in London….The range of his writing, and the wealth of material that flowed from his prolific pen, was vast…..His subject matter ranged from Buddhist catechetics, pedagogy and Masonic history to the origins of Christianity, the causes of war, and the nature of the soul; from life after death, reincarnation, heaven and hell, to the evolution of man, the unseen effects of sunlight and the value of vegetarianism….The modern occult revival owes more to him than to anyone else. A freemason, Leadbeater was part of The Theosophical Society, an esoteric society founded in New York City in 1875. At the time of its founding, the society described itself as concerned with the study of “universal brotherhood,” comparative religion, and “the unexplained laws of nature.” The organization, despite various internal divisions and schisms over the years, is considered a cultural forebear of the New Age movement, and even partially responsible for the mainstream popularity of Eastern traditions like Buddhism and Yoga throughout the West today. If you’re interested in the non-pop-cultural answer to the question, “what is Yoga?” I recommend the Freer|Sackler’s 2013 exhibition catalog for Yoga: The Art of Transformation. The essays and selected artifacts in the book do an excellent job of demonstrating why the answer to that question is pretty complex— culturally, philosophically and historically speaking. Because of yoga’s (more specifically, asana’s) widespread popularity today, it would be tempting to assume that the notion of chakras is some sort of sub-discovery within the tradition of asana, when in fact it’s more the other way around. Plate VIII, “The Streams of Vitality,” shows the arrangement of chakras and corresponding energy channels on the body. So what is a chakra? According to Ayurvedic tradition, chakras are circular fields of bodily energy. Leadbeater’s guide describes each one in plentiful detail: its placement on the body, size, shape, colors and even vibratory pulsations. Leadbeater points out that healthy chakras are large and vibrating with iridescent light, whereas the chakras of those who are less healthy and less spiritually developed will be noticeably smaller, duller, and weaker-looking. This use of Western technology (in this case, high res full-color lithography) to illustrate or “prove” ancient belief is itself an interesting habit of modern onlookers eager to produce familiar forms of understanding. Today’s use of advanced neurological scans to study the brains of Buddhist monks comes to mind as a contemporary example of Western science exerting its most advanced technological tools on ancient tradition, as if this tool could determine absolute value in a relative world. Though at first it may seem like a non-sequitur for a design museum, this rare book tells a story of inter-continental cultural exchange and the technologies in its service, during a moment of early globalization that would have great impact on future generations and our collective imagination. Katie Shelly is Media Technologist in Cooper Hewitt’s Digital and Emerging Media department. Gregory Tillett, The Elder Brother: A biography of Charles Webster Leadbeater (London, Routledge & Kegan Paul, 1982), 3-4. Mark Singleton, Yoga Body: The Origins of Modern Posture Practice (New York: Oxford University Press, 2010), 81-113. Previous Post Celebrate Preservation Week!